Impressive for any occasion, this glorious bouquet of favorite flowers will bring sunshine into any room. 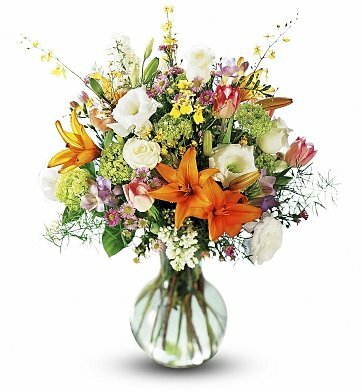 Arrangement includes such flowers as tulips, Asiatic Lily, roses, orchids freesia and more in a lovely glass vase. Daylight Bouquet is a hand delivered gift. These gifts are delivered by one of our local design centers located throughout the United States and Canada. Same day delivery is available for most gifts when ordered before the cutoff time. The cutoff time for Daylight Bouquet is 2 PM in the recipient's time zone. Sent flowers as a gift for a colleague who has having a tough day - she ended up leaving before flowers were delivered - florist arranged to have flowers delivered at her convenience the following week - arrangement was fresh and gorgeous!